OK, what? 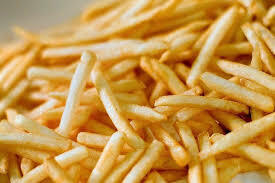 Are French fries killing us? What does that really mean? Is there some conspiracy among food manufacturers to make us a sick and die early? Well, to some extent, the answer is yes. If you understand that food is medicine and that our health has a whole lot to do with how we nourish our bodies, then connect the dots. A varied and balanced diet of whole, unprocessed foods – food as nature intended, not as manufacturers invented – typically produces humans of very good health. Combine that with maintaining close and loving connections with family, friends and community as well as moving the body naturally or through exercise and you’ve got a recipe for a healthier life and, quite likely, a longer and happier one. So what about those French fries? Are they the culprit? Not exactly. Not specifically anyway. The research suggests that people who eat fries a few times a week generally have poorer overall health habits than those who don’t. 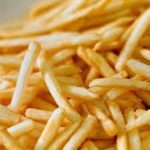 If you’re eating fries regularly, you are also most likely eating an overall diet that has more refined sugars, less fiber and more saturated fat; more Omega 6 and less Omega 3, and that is a recipe for systemic, chronic inflammation. And it is exactly this type of inflammation that is responsible for so many of our chronic illnesses. So what does that mean for you and me? The occasional order of fries will certainly not cause irreparable harm for the vast percentage of the population and are simply delicious. So splurge once or twice a year and enjoy! The key here though is really about the rest of the choices you make. When shopping, pass up the boxed, frozen and canned processed food in favor of fresh or frozen, preferably organic fruits, vegetables, meats and poultry whenever you can. Unless you have a condition for which it’s countra-indicated, limit the oils and fats in your diet to organic, unrefined coconut, grapeseed (in limited amounts), canola oil (occasionally), or grass-fed butter/ghee for cooking; and olive, walnut and avocado oils for salads and dressings. Eating these particular oils support human health. And don’t worry about skimping on them. In fact, our bodies need fat for proper functioning and, an added benefit is that you might just find that the more of these fats you eat, the more likely you are to lose weight. Yes, I am not kidding! Increase healthy fat to decrease unhealthy fat! Aim for a colorful plate of food that is 80% plant material and 20% lean animal or vegan protein. Be a Savvy Senior. Make choices that support your health. Limit fast and fried foods, eat a varied, colorful selection of vegetables and fruits and don’t worry about the occasional splurge of fried potatoes. It won’t kill you! They don’t kill as quickly as a bayonet though!